As pointed out yesterday in the Tales post, "Oh, Canada, Re-Elect Harper", the Prime Minister of Canada for three terms, Stephen Harper, has been one of the most ardent, unwavering supporters of Israel among all the leaders in the world. He was a true profile in courage as he would stand up for Israel and against anti-Jewish bigotry at home, even at political expense to himself. That is why the Tales urged Canadians to re-elect him for a fourth term. Unfortunately, Stephen Harper's Conservative party did not win and the Liberal party's, Justin Trudeau was elected the new Prime Minister of Canada. 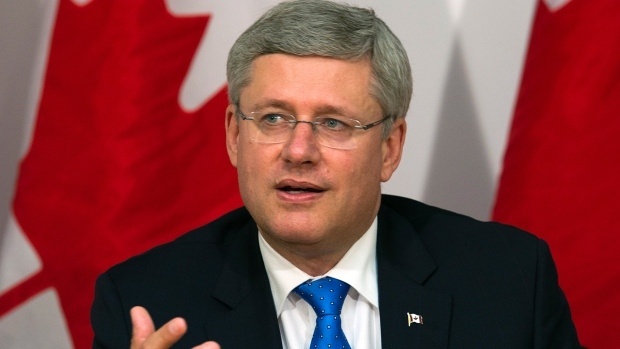 As Canada turns to the left, Israel has lost one of it's great supporters in Harper. From the Oct. 20, 2015, Wall Street Journal "Trudeau victory projected": "OTTAWA—Canada’s Conservative Party was on the verge of being ousted in a national vote Monday after almost a decade in power, as voter discontent and a souring economy appeared set to help the son of long-serving Prime Minister Pierre Trudeau sweep to power." Tales recognizes and praises the outgoing Prime Minister for his staunch support for the state of Israel. Thank you, Stephen Harper for being one of the few true friends among the leaders of the world that Israel has. Let us hope and pray that Justin Trudeau, who, if the final results show that you are indeed the next Prime Minister of Canada, will follow in your footsteps and be such a strong supporter of Israel.